35 Commercial Real Estate and Properties in Melbourne Western Suburbs are listed in 8 categories. We have 72 Industrial Warehouses for Sale , 35 Development Lands for Sale , 11 Retail Shops for Sale , 5 Medical and Consulting Properties for Sale , 5 Offices for Sale and 1 Showrooms for Sale . Approved plans for a development of 6 townhouses (plans available upon request) An exciting future for this fabulous site of 766m2 Where the position offers immediate rewards with rental income today and bright future for tomorrow. Home comprises three bedrooms, bright kitchen with meals area, huge formal lounge perfect for entertaining. With loads of extras including ducted heating, gas heater, air conditioner and carport, make this a comfortable home or a sought after investment. Walking distance to Conrad Street shops, Keilor Downs Plaza, St Albans Leisure Centre, schools and Keilor Plains Station. Your opportunity to secure the future for you and your family! Attention builders, developers and investors take a closer look at this property. Perfectly positioned on a generous 565m2 approx, allotment with plans and permits for 3 townhouses. This property is located within walking distance to Caroline Chisholm College, Skinner and Kinder Smith Reserves, public transport, shops and other facilities. The home comprises of 3 bedrooms, central bathroom, generous living with gas heating, spacious kitchen with adjoining separate laundry and expansive rear yard with sizable garage, large enough to store two cars and more. Rental return: $1,347 per month Live or invest now and develop later? In the highly desired location in Braybrook, this rare offering will strongly appeal to savvy investors, developers and home buyers, this weatherboard home offers immediate living accommodation and is meters from Shopping, Schools and Public Transport. With multi unit development potential or perhaps your dream home (STCA) The existing home comprises: 4 large bedrooms, lounge room, updated kitchen with adjoining dining area, bright central bath room all on a substantial site measuring 21.53m x 30.48m approximately 656m2 Position and potential! 745m2 With Permits For 3 Townhouses PLANNING PERMIT APPROVED! Ray White St Albans are proud to offer this fabulously maintained, warm and inviting 3 bedroom family home, with a spacious lounge, kitchen/meals area and a generous backyard, Located close to everything. Situated in the most desirable pocket of St Albans. Minutes to all amenities including St Albans Station, bus stops, Brimbank College, Stevensville Primary School and close proximity to Brimbank Shopping Centre and freeways. There is no doubt this is and will be one of the hottest pockets in St Albans. This lovely home is on an expansive allotment of 745m2 (approx.) with potential for re development (S.T.C.A), with planning permit for 3 townhouses. Call now to arrange an inspection. Sitting on a generous block of land this red brick home is ideally suited to the astute purchaser who appreciates quality. A family home with character, a warm welcoming feel and modern design, relaxation and kids' activities are just some of the attributes that define this bright 3 bedroom home, master bedroom with full ensuite. Inviting formal lounge, dining and family rooms, superb kitchen with stone bench tops leading to the enticing, super rumpus room. All this plus a self contained bungalow for the teenager, in law or outlaw? Appreciate quality family living coupled with scope for future development if you should desire (STCA) Close to primary and secondary schools, Victoria University campus, Library, Alfrieda Street shops, St Albans station and minutes to major arterial roads. Family Home On 852m2 Approx! 852M2 OF FUTURE DEVELOPME.. Enjoying close proximity to St Albans Shops, bus, train station, schools, parks and easy to access freeway, enjoy the location with your own impressive allotment of approx. 852m2 This beautifully renovated home offers 3 spacious bedrooms with robes formal lounge, laundry, self contain bungalow! What more can you ask for? Ducted heating, cooling, shed, and large back yard. Set on Massive sized allotment of 852 m2 (approx). An inspection is highly recommended! Don't miss out on this once in a lifetime opportunity. 4 Dwelling Planning And Building Permits Approved. 4 UNIT PLANNING AND BUILD.. In an excellent pocket of St Albans East, this family home on a large allotment of 766m2 approx. presents a fantastic opportunity to commence building upon settlement or live/invest now and develop later. The house consists of 3 generous bedrooms, formal lounge, open plan kitchen/meals area, central bathroom, separate toilet, large laundry with rear access, Features: hardwood floors, cooling, large garage and much more! Walking distance to the St Albans shops, Schools, public transport and medical centres. This property is ready to build now with all permits in place, be quick projects of this nature are hard to find! Situated in a prime St Albans location on the corner of Andrea Street Glendenning Street, this property is set on a large block of 697 m2 approx. This Brick home has 3 bedroom, central bathroom, lounge room, timber kitchen/meals area, garage/bungalow. Walking distance to St Albans Shops, schools and public transport Rental return is $1650 per month approx. Rent, renovate or develop the choice is yours. A highly desirable allotment of approx 782 m2 offering a fantastic option to live now, build later, all whilst the property remains sound and comfortable. It has an approved town planning permit for 4 dwellings. This home offers 3 bedrooms, central bathroom functional kitchen, meals area, formal lounge. Situated in this outstanding location and within walking distance to Train Station, schools, medical clinic, Keilor Downs Shopping Centre and easy access to the Western Ring Road Features: split system cooling, roller shutters, huge workshop, double garage and much more! Administrators Auction! 1,422m2 Rgz Corner! BUY ONE OR BUY BOTH! SUBSTANTIAL CORNER DEVELOPMENT OPPORTUNITY! This rare high density corner development opportunity is situated in central St Albans. A short stroll to Alfrieda Street Shopping precinct, the new St Albans Train Station, Community facilities, High School, Primary School and Victoria University, only a short distance from Sunshine Hospital. The existing home offers three good size bedrooms, kitchen, adjoining meals area, separate living plus a bungalow at rear. A substantial corner allotment of approximately 713.7m2 and 708m2 (1422m2), providing an exciting development prospect to build multi level apartments, units/townhouses, plus many other development possibilities including Child Care, Medical Centre (STCA). Don't miss out on this once in a life time development opportunity. Builders Investors This Is A Golden Opportunity FORTHCOMING AUCTION! This site is centrally located within walking distance to all amenities: schools, shopping centre, public transport, hospitals and easy access to the Western Ring Road. A substantial site of approx 1,393.5m2 in this superb location with planning approval for 8 units including a combination of villa units and townhouses. Grasp this opportunity as sites of this quality don't come often so don't miss out!!! The possibilities are endless with potential for business/medical use or multi unit development (STCA) in this prime location. Sitting on 606.7m2 (approx.) this is an ideal opportunity to secure this rare property on famous vibrant Alfrieda Street metres from all the shopping facilities, public transport and all St Albans has to offer. This elevated brick home comprises of 3 bedrooms, spacious formal lounge, kitchen and dining room, high ceilings and much, much more! This is a once in a lifetime opportunity to secure a prime piece of St Albans on its most famous boulevard. Land Of Opportunity URBAN GROWTH ZONE! Substantial land parcel of 12.14HA (30 acres) with wide frontage in superb location "Urban Growth Zone" suitable for further subdivision (STCA). Currently utilized for growing oats and peas. Includes a quality home that comprises of wide entry hall, formal lounge, superb kitchen with modern appliances and large breakfast bar, dining, family and rumpus rooms, study, 3 bedrooms with robes, master with ensuite. Features heating, cooling, double garage plus large machinery shed. This is an opportunity not to be missed. Residential Growth Zone Corner! PERMITTED DEVELOPMENT SITE! Industrial land of 2543m2 Zoned industrial 1 Minutes from High Street and Western Freeway on/off ramp. Excellent location within Harrison Industrial Park Freeway exposure Plans And Permits for two approx. 700m2 office warehouses Contact Andrew Shields on 0408 443 202 to arrange an inspection today! Double The Land And Double The Opportunity Develop and occupy! 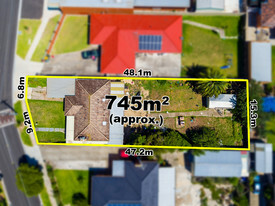 Set on approximately 1281m2 explore the possibilities and potential rewards and enjoying a quality lifestyle or rental income while you develop another home or units on this substantial site (STCA). The quality home comprises of: 4 good size bedrooms, Master with full ensuite, separate lounge room, open plan family/meals, rumpus, sensational kitchen with stone bench tops, central bathroom, huge backyard with an outdoor entertaining area. Located in this ever appreciating pocket of St Albans East close to all amenities including shops, schools, public transport and easy to access Freeway and Ring Road. The options for this property are endless. Corner In Perfect Location! GROWTH ZONE CORNER! If position, convenience and value are at the top of your checklist, then heres the one for you. This home is a perfect sited on approx.697m2 of land. Go for a short stroll, and within minutes youll be at the Ginifer Train station, bus, schools, parks and Medical centres The recently renovated family home offers the astute buyer enormous potential to retain the existing house and further add units/townhouses on this sizable corner allotment (STCA) It consists of 3 generous bedrooms, large lounge room, renovated hostess kitchen adjoining dining area, updated bathroom and laundry facilities, plus bungalow. Features: newly polished floorboards, high ceilings with ornate plaster work, undercover entertainment area, huge garage and much more. Prime! Prime! Prime! Real Estate! PRIME PRIME PRIME ST ALBA..
First time offered in over 70 years. A truly rare offering, on a substantial allotment of 613 m2(approx. ), with flexibility for redevelopment within the favourable Residential Growth Zone which allows for up to 4 levels of construction. An almost limitless opportunity to re invent this big block into a multi dwelling site (STCA) The home has 3 Bedrooms, large lounge room, kitchen, meal areas, large backyard, entertaining areas and a self contained bungalow. Situated a short distance to all St Albans has to offer, public transport, Library, shops, cafe's, Sunshine Hospital. To all home buyers, investors, developer/builders. 782m2 Of Opportunity! 782m2 in Residential Grow..
Once In A Lifetime Opportunity In Residential Growth Zone! 920M2 COLLINS STREET CORN..
A Prized gem situated in the central activity area of St Albans with flexibility to pursue development possibilities in this outstanding location. The home comprises 6 bedrooms, spacious lounge, kitchen and 2 bathrooms, Set on a grand allotment of 920 m2 (approx), the property is occupies one of the best locations St Albans has to offer, walk to shops, schools, Alfrieda Street, Medical clinics, St Albans train station and library. An absolute prime piece of St Albans that could be yours! 1625 M2 In Residential Growth Zone! Buy 1 or Buy Both! Walking distance to Keilor Plains station, Keilor Downs Shopping, Schools and St Albans Shops. Set on a large block ( approx 1626 m2 both properties ). In one of ST Albans 's most desired location, this rare huge allotment will strongly appeal to savvy investors and developers.Permits have been approved to build 10 dwellings . With location, town planning approval and great potential on your side.